Image via Flickr courtesy of michael.bruntonspall used under a Creative Commons licence. 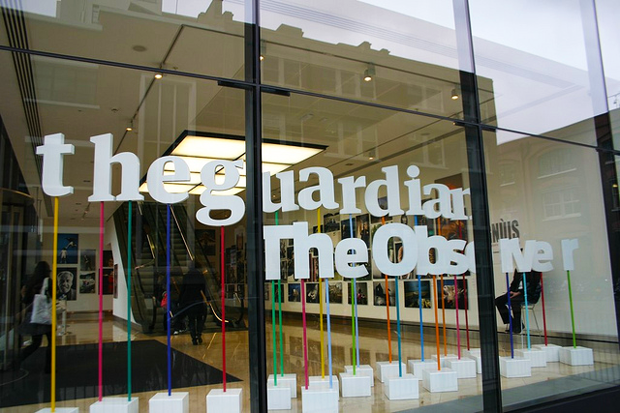 Wolff portrays the Guardian as a news outlet alone in losing print readers, grappling with replacing advertising revenues and wanting to grow its audience base. The Guardian is not unique in suffering from declining print advertising revenues. The fall is universal. Mark Perry has tracked annual data from the Newspaper Association of America (NAA) from 1950 to 2013. 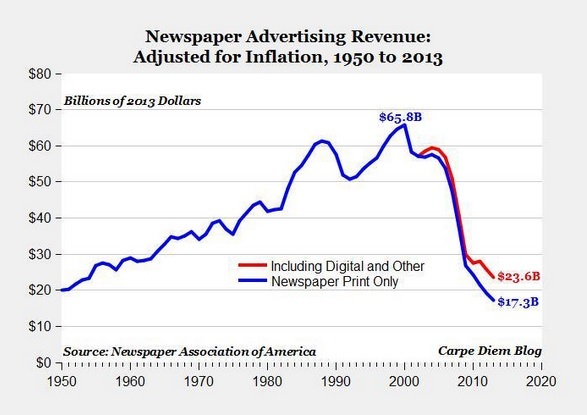 Using inflation adjusted (2013) figures the chart shows the decline in print newspaper advertising to a 63-year low in the US with more than half of that decline being suffered in the last five years. 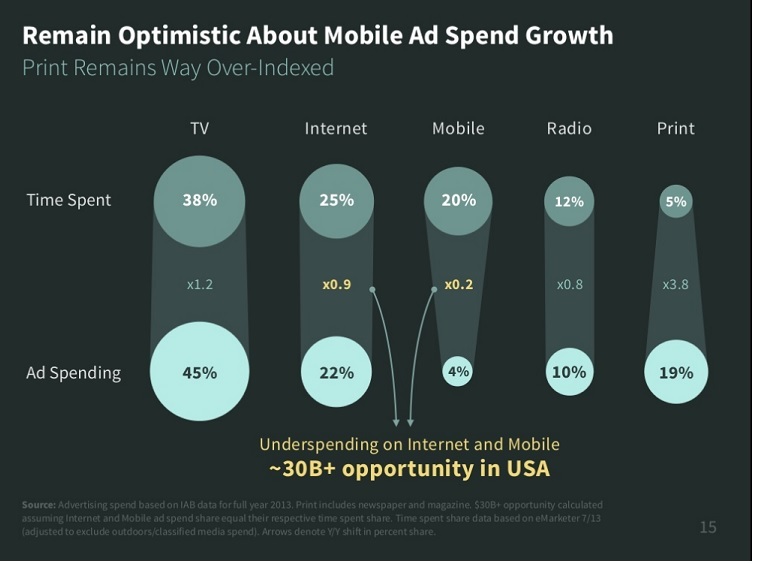 Kleiner Perkins Caulfield Byers partner and long-time internet analyst Mary Meeker’s latest State of the Internet presentation contrasts the amount of time that users spend on a specific form of media — mobile, print, TV etc. — with the share of advertising spend devoted to that platform. Again, like Professor Perry’s analysis above, the decline in print-advertising revenue is not stopping, or even slowing down. If anything, it is likely to accelerate. Wolff cites the Economist and the Financial Times as news outlets which the Guardian should emulate in terms of business model. There’s more than one way to skin a digital news cat. The Guardian should look forward to the born digital news outlets like Buzzfeed, Vice, First Look Media, Vox Media and Huffington Post as well as backwards to traditional media business models. The key to success will be in trying different things to get news working for the digital age. Wolff writes that “US expansion has long been a Guardian dream. For some years now, there has been no growth left for it in the UK market.” One view of journalism’s future is that of a handful of mastheads with truly global audience share. The business model of mainstream media depends on mass. The Guardian is pitching its hat into the ring as a global contender for news. It makes absolute sense to get close to large English-speaking, wealthy readers. The sort of readers who will be attractive to advertisers. The sort who could afford subscriptions should there be a change in business model. This means being close to the US audience. It means being close to other markets, too, such as Australia – where the title launched 13 months ago. Wolff dismisses Janine Gibson, editor-in-chief of Guardian US, as “a Guardian lifer and Rusbridger factotum and alter ego, who had never worked in the US.” A woman whose initial positioning of the US Guardian Wolff describes as “cockeyed and tone deaf”. It isn’t until a post script to the article that we learn the New York Times held Gibson in such high regard for her US journalism abilities that they approached her to become co-managing editor of the Grey Lady. Gibson is soon to return to the UK to take up an elevated role as editor-in-chief of theguardian.com and deputy editor of Guardian News & Media. This is contrary to how Wolff describes the move: “in which she merely gets her old job back”. Gibson will be replaced by Katharine Viner who has enjoyed a stellar year opening the Guardian’s Australian offering in Sydney. Launched in May 2013 Guardian Australia is already one of the top ten Australian news sites.